Update February 2018: Sadly it looks like the Wat Suan Dok website is no longer functional. I’m not sure if they’re still offering the retreat described below. If anyone in, or traveling to, Chiang Mai could post an update in the comments I’d really appreciate it! Taking advantage of cultural education opportunities around the world was high on our list of goals when we left home last year. Around the time we were leaving I started to develop an interest in meditation so taking a Buddhism and meditation course while in Chiang Mai, Thailand seemed to be a perfect fit. 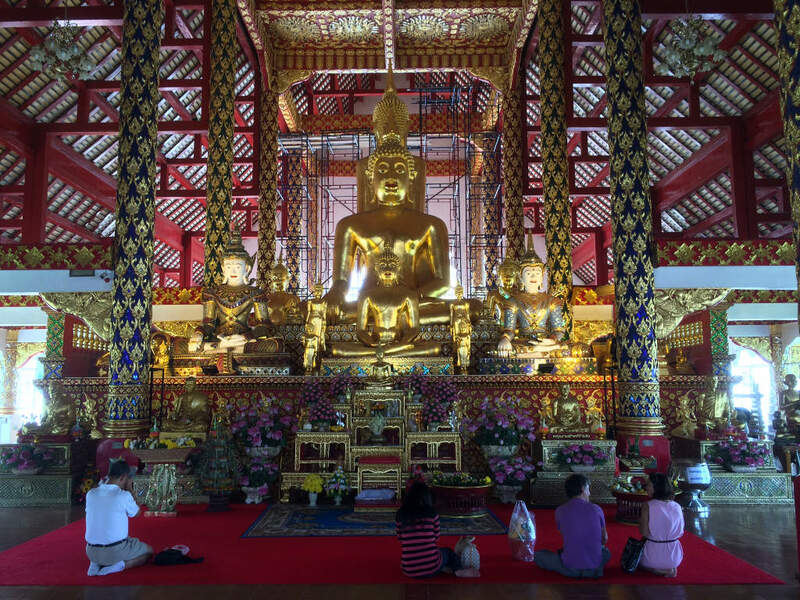 There are several opportunities in and around Chiang Mai for meditation instruction and practice. Many temples offer retreats measured in weeks, not days. 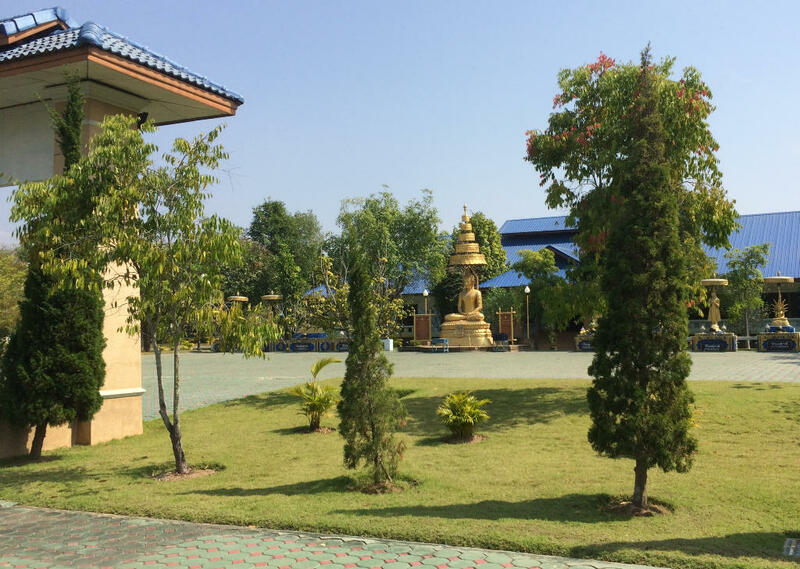 There are also shorter classes lasting a few hours like the one at Wat Sisuphan, but I was looking for something a little more involved than a basic introduction. I was intrigued by the idea of a retreat, but I didn’t want to devote my entire month in Chiang Mai to one, nor did I want to spend that much time away from my family. Luckily Wat Suan Dok offers the perfect balance: a 2-day meditation retreat. The retreat is a mix of background on Buddhism, meditation instruction, and a lot of meditation practice. It’s held every Tuesday and Wednesday except for certain weeks noted on the website (link removed Feb. 2018 – see note above). One more thing – it’s a silent retreat. 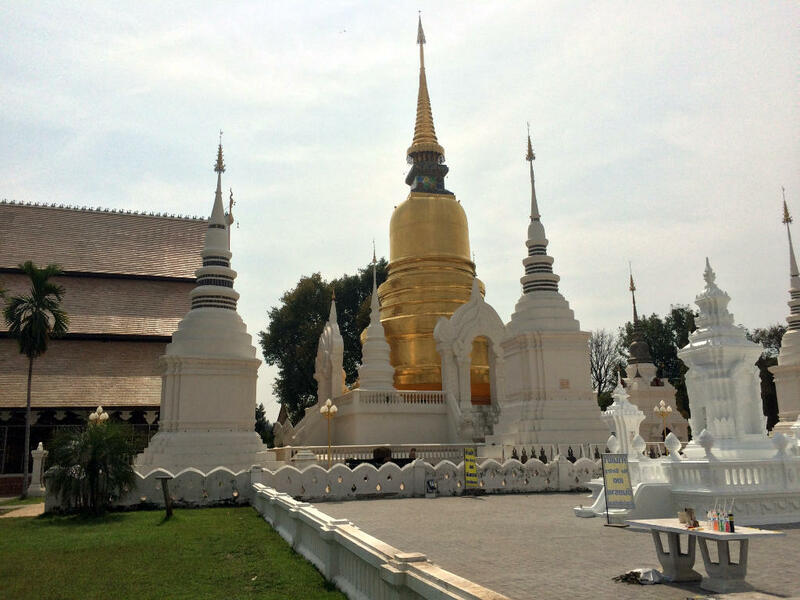 On Tuesday I arrived at Wat Suan Dok at about lunch time. After checking in and picking out my meditation whites (required apparel) we had some time to explore the Wat Suan Dok grounds before the official program began. The retreat kicked off with a short introduction to Buddhism, and particularly Buddhism in Thailand. The presentation was made by an orange-clad monk operating a PowerPoint presentation from a slick laptop – quite a contrast. It was just the right amount of background to prepare me for the meditation practice ahead. After the introduction all of the participants (there were about 30 of us) loaded into songthaews and were driven to the meditation center, about 30 minutes outside the city. This is a facility dedicated to meditation instruction and practice, and the setting really helps with getting into the proper mindset. There are peaceful gardens, Buddha statues, and not much noise besides birds and insects. Exploring the grounds of the meditation center. When we arrived our monk instructor asked us to pair up for room assignments. Accommodations are two-to-a-room and not co-ed (even for couples). The rooms are actually nicer than I would have imagined. They’re large and each one has a private bathroom with shower. No frills (this is still a Buddhist meditation retreat) but completely clean and functional. After we all went to our rooms and changed into our white clothes we reconvened in the central meditation hall and the silence began. From this point on, about 5 p.m., we would not speak until afternoon the next day (except for a short discussion session with a monk the following morning and reciting chants to reflect on food at meal times). The rest of the retreat mostly followed this routine: short meditation instruction, meditation practice, repeat. The monks instructed us in sitting, walking, standing, and lying down meditation (no this is not the same as sleeping). Essentially each of these methods is simply a different body position while you do the same thing with your mind. The mental part is of course the whole point. This particular workshop focused on “concentration meditation” – training your mind to focus on command and maintain that focus. Humans, by nature, are not very good at this and the monks refer to the normal chaotic state of the mind as “monkey mind”, jumping from branch to branch. Stress and anxiety are often the result of this chaotic mental state. Meditation can help to calm the monkey mind and relieve the stress. We stopped for a delicious (silent) dinner, during which we were encouraged to contemplate our food before eating it and reflect on its nourishing qualities. 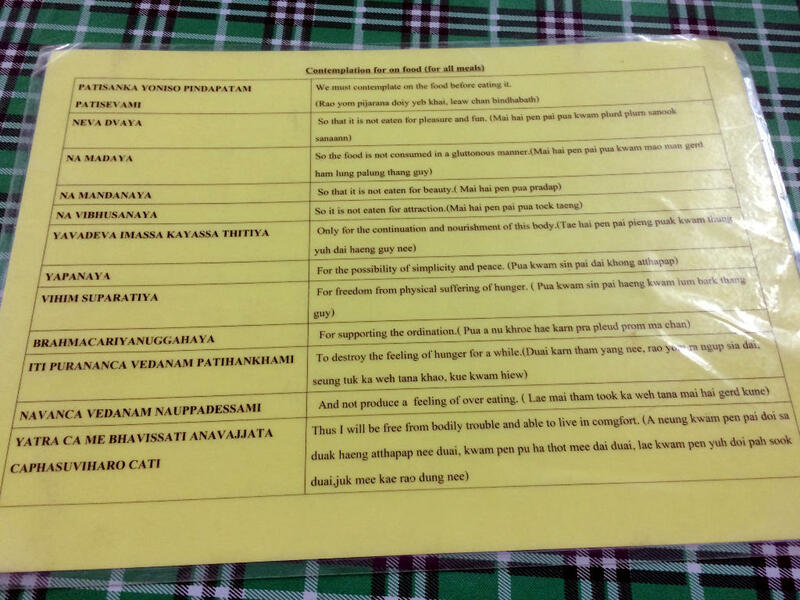 To help teach us what life is like as a monk we recited chants at each meal intended to help focus on why we eat. The monks explained that they were not trying to teach us to renounce eating for pleasure, but simply trying to expose us to a day in their life. The meditation course continued until just after 9 p.m. when it was lights out and time to sleep. I was glad for the early bedtime because the gong went off at 5 a.m. for more practice. After a quick tea and coffee opportunity we got right on with more meditation in the main hall. With the sun still well below the horizon we then moved on to Qigong instruction outside. Qigong is a slow, mindful exercise intended to cultivate “chi” – basically your inner life energy. The form we learned involved movements that mimicked 5 animals: the dragon, tiger, snake, leopard, and crane. Each movement is intended to improve health in one key body organ. The Qigong lesson was probably my favorite part of the whole retreat. While it looks slow and leisurely to an observer, it was actually a surprisingly physically challenging workout. As the sun was rising over the mountains towards the end of the session I felt incredibly peaceful but also energized for the day. After Qigong we gave alms to the monk by offering a small bowl of rice as he walked by. In Thailand you’ll often seen monks walking the streets with round metal bowls in the morning and this is what they are doing. It’s intended to teach people to give first before thinking of themselves. The rest of the second day was filled with lots more meditation practice, breakfast, lunch, and a 1 hour discussion session with a monk. The discussion was great and any question was fair game. Some folks asked about meditation, some about Buddhism. The hour went by very quickly. The main difference on the second day (besides the Qigong) was that we had a lot more independent practice time. For example while one group was having their discussion session the rest of us were instructed to go outside, find a quiet place on the grounds, and meditate by ourselves. This was my favorite meditation session and I spent the whole hour sitting quietly beneath a tree (I don’t get many quiet hours these days). The retreat ended about mid-afternoon and we all started chatting again as we rode back to Wat Suan Dok. The retreat itself cost me only 500 baht ($15). In addition to that I needed to buy white clothes (you can use your own if you have them) for an additional 300 baht ($9). I kept my white t-shirt but donated my white pants back to the program, along with a small cash donation. It’s a terrific program and I felt like the 500 baht was a bargain, so I was happy to kick in a little more. I loved this meditation course. It was a great opportunity to get some quiet reflection time and I feel like it has given me tools that will continue to help me going forward. Here are some of the main lessons I will take with me. The key to meditation being helpful in your life is practice. Just as one training session at the gym will not make you an Olympic athlete, one meditation session does not cure you of stress and anxiety. Ongoing practice is essential, so that when a stressful situation or thought occurs, your mind is better able to deal with it. Work on balance between mind and body. We all spend a great deal of time taking care of our bodies. Even if you don’t exercise regularly, you probably bathe, cut your hair, trim your nails, buy clothes to keep warm and dry, and more. We spend hours each day taking care of our bodies. But what about our minds? Meditation is like going to the gym for the mind. In this context spending some time meditating each day sounds pretty reasonable. The natural state of the mind is chaos (like our hotel rooms). It takes consistent work and effort to put things in order. Awash in temples and Buddhist tradition, Chiang Mai was the perfect place to dive into this awesome cultural experience. I’m extraordinarily grateful to Kat and Nana and Papa for wrangling the kids on their own so I could participate in the meditation course – it will be a lifelong souvenir of this adventure! I was blessed to have met you, Kat, and your lovely children about a year ago when you offered your lovely upholstered vintage chair to me. The chair was beautiful and I value older furniture and the history behind each peace. I love reading about your adventures and your perspectives about your travels and everything involved in seeking solutions to ordinary life issues – such as finding a camera tech person, etc. I am happy for you – leave caution to the wind and go after your dream. You are indeed a brave couple, living your life’s dream. Bravo to you all. You are lucky you have a the kids grandmother with you. That is a dream for her, as well. Truly, you have inspired me to live each day with purpose and to plan ahead for my future aspirations. Have a dream, plan for it, and finally make it a reality. Pleasant trekking with the twins and be safe. Hope you are catching a few quiet minutes these days to practice your meditation on a daily basis. Glad you got so much out of the two day retreat. We lost our nerve and went for the free one day meditation course instead. Amazing! We both loved Monk KK and gained a lot from the day. That’s so cool that you took a chance at least on the day course! That retreat has paid dividends for me basically every day since then, and I’m sure you learned the same fundamentals. I am itching to try one of the longer retreats now as well. Thanks for stopping by to leave a comment! Hi! The monk chat website is down, but do you know if the courses are still running? I am going to thailand in Jan 2018 🙂 Thanks! Hi Joana – sorry for the late reply! I’m not sure if they’re still running courses. Hopefully you can update us after your January trip!